Recently, I wrote an article on how the Bureau of Labor Statistics, an agency in the Commerce Department, underestimates the tremendous economic improvements that Americans have enjoyed since 1970. I posted it on GaryNorth.com. Then I posted it on Tea Party Economist. Next, Lew Rockwell posted part of the article on his site, with a link back to GaryNorth.com. So, it got a lot of readers. I received a few emails thanking me. But then I received a critical response. This email is typical of those people who dwell in the past. It was clearly written by an old-timer. He may even be my age. These people think the good old days, economically speaking, were good — better An Essay on the Nature... Lionel Robbins Check Amazon for Pricing. than today. Put differently, they do not recognize that the free market has made the whole world richer, and with the world, Americans are richer. No, no, no, they insist. Things were good in Richard Nixon’s first term. Really good. Better than today, even. Improved cars and appliances sounds like the hedonic CPI quality adjustments criticized as a distortion of the real cost of living by most Austrian economists.The lack of conservative publishing outlets probably was a reflection of the steady increase in incomes from 1946-1970, and the fact that the country was much less polarized. Especially since at that time foreign policy was believed to be mostly non-partisan, and we were only a few years into the culture wars, it just wasn’t that important who won elections, so there was little interest in alternate sources of information. Private education may be better, but it’s also much more expensive, pretty much out of reach for people in the lower half of incomes. Probably because public education is so much worse. Christian values may be part of the learning environment in some private schools, but, for those values, parents stuck with the public schools are out of luck. You didn’t address the, in my opinion, most significant difference. Before the late 1960’s, there was much less of the lawlessness, violence, hostility, and vulgarity in society that we take for granted today. I love to receive emails like this one. They make possible responses like this one. He begins with this statement: “Improved cars and appliances sounds like the hedonic CPI quality adjustments criticized as a distortion of the real cost of living by most Austrian economists.” First, most Austrian economists do not take very seriously any index, because of the fundamental premise of Austrian economics: subjective value theory. This leads to a conclusion made by one of Ludwig von Mises’ disciples, Lionel Robbins. In 1932, Robbins made this point: it is impossible scientifically to make interpersonal comparisons of subjective utility. There is no objective unit of measurement. There is common scale of well-being. 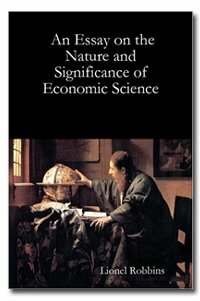 He argued this in Chapter VI of his book, The Nature and Significance of Economic Science. Most economic statistics don’t lie, but they mislead.The statistics produced by the Bureau of Labor Statistics are pretty good, according to prevailing economic theory and statistical theory, but they are misleading to a fault. This is not because the government rigs the statistics. It is because objective statistics cannot deal effectively with subjective value. But subjective valuation is the essence of economic theory. This was discovered in the early 1870’s. The statisticians still have not come to grips with this development. They try hard, but the labor theory of value is wrong. They fail. But my critic did not understand this, and so he claims that “most Austrian economists” — unnamed — reject “the hedonic CPI quality adjustments criticized as a distortion of the real cost of living by most Austrian economists.” Most Austrian economists are skeptical about the concept of indexing altogether. My point in my article was this: the CPI does not reflect all kinds of crucially important things. The statisticians do their best to account for quality improvements, but they fail. This was the thesis of my article, and my critic did not understand this central fact. Warning: if you ever send an email to someone who has had an article published, and you have never had an article published, it is best to begin with a clear understanding of what the article says. Does this make sense? I will say this of “most Austrian economists”: they perceive that free market competition and innovation lead to quality improvements. They see this from introspection. They have memories of changes that have made their lives better. They may even collect old items, such as typewriters. They no longer use these items, because these items are obsolete. I do not call this the “hedonic calculation effect.” I call it the buggy-whip effect. Anyone who is unaware of the fact that buggy whips are obsolete is probably Amish. But, then again, he does not read my articles online. Can You Breathe Yourself Slim?